•	1/2 cup unsalted butter at room temp. Cream together the butter and sugars in a mixer. Add the eggs and vanilla, making sure to scrape down the sides of the mixing bowl. Add the flour, salt, baking soda and baking powder and mix on low until everything in incorporated. Fold in the chocolate chips. In a medium sauce pan, melt the butter over medium high heat. Add the sugar and cocoa powder once the butter is melted. Whisk to combine and remove from heat. Add the salt, vanilla and eggs and continuously whisk until the eggs are combined. Add the flour and continue to mix. 	Preheat the oven to 350 degrees. 	Line the bottom of a 9×9 baking pan with tin foil and then spray on a layer of “baking cooking spray”. 	Press down the layer of cookie dough. 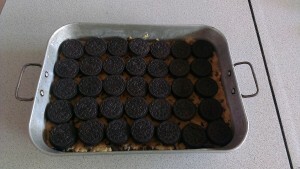 	Add one single layer of Oreos on top of the cookie dough. 	Pour the brownie batter on top of the Oreos. 	Bake for 30-35 minutes. Cookie dough with on top the Oreos. Baked, beautiful, and delicious supreme brownies made by Halden all by himself.